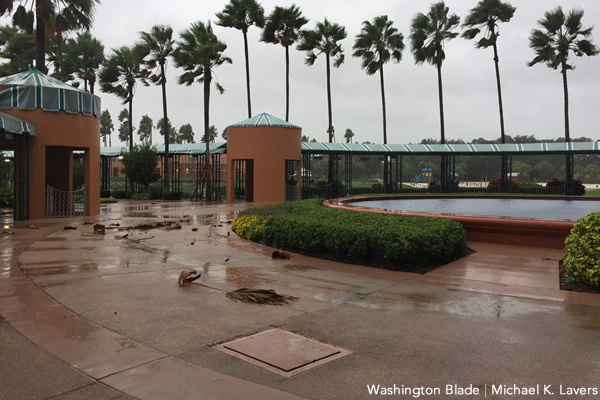 ORLANDO, Fla. — Hurricane Matthew did little to dampen the spirits of the thousands of people who were attending the 2016 Out & Equal Workplace Summit at Walt Disney World. “The conference has been great,” Angela Orlando, a transgender woman from Bound Brook, N.J., told the Washington Blade on Friday as she ate lunch in the Walt Disney World Swan and Dolphin Resort with Debbie Drew, who chairs Out & Equal Workplace Advocates’ Transgender Advocacy Committee. Biagio D’Isanto, who lives in London, told the Blade he spent “more time trying to calm down” his family in Italy during the hurricane. 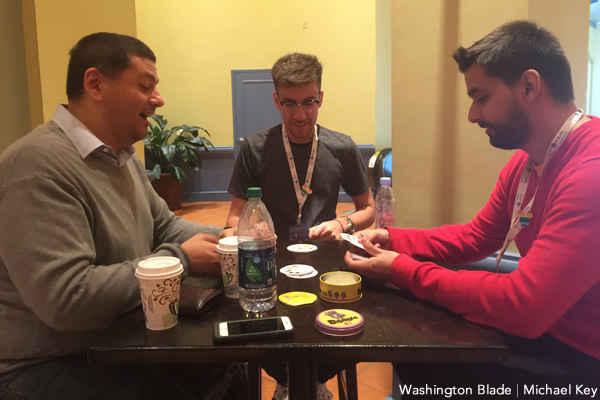 D’Isanto spent part of Friday afternoon playing a card game in the hotel lobby with Niarchos Pombo of São Leopoldo, Brazil, and Ezequiel Massa of Buenos Aires, Argentina. The three men who work for SAP Software Solutions, which is a Germany-based multinational corporation, had never experienced a hurricane before. Massa told the Blade it was also the first time he attended Out & Equal’s annual conference. Wind gusts of up to 80 mph were expected in the Orlando metropolitan area as Matthew approached Florida’s East Coast. The hurricane prompted organizers of Orlando’s Pride parade that had been scheduled to take place on Saturday to postpone it. The National LGBTQ Task Force also rescheduled a gala that was to have taken place in Miami Beach, Fla., this weekend. Walt Disney World closed at 5 p.m. on Thursday. Many people who were attending the conference left before Orlando International Airport shut down ahead of Matthew. Several thousand people who were attending the conference attended a party at Disney’s Yacht Club Resort that had been moved indoors because of the weather. The Walt Disney World Swan and Dolphin Resort and nearby hotels curtailed operations during Matthew, but they remained open. Tropical storm force winds and torrential rain lashed the area for several hours on Friday. Matthew downed a handful of palm fronds and tore awnings, but there was no other visible damage in the immediate area in which the conference was taking place. The electricity and internet remained on throughout the storm. Assistant Secretary of Transportation Jeff Marootian on Friday applauded local, state and federal authorities’ response to Matthew at the beginning of his speech at the conference. Massa thanked Walt Disney World and hotel staff who remained on site throughout the hurricane. “I felt very safe,” he said.